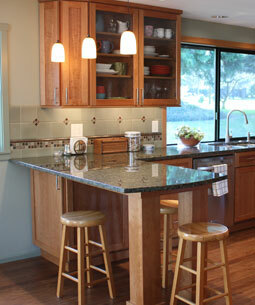 We initially approached you for design advice regarding a complete kitchen remodel. After meeting with you and discussing our plans and goals it was clear we needed professional help to achieve our desired result. I identified very specific needs with respect to function with a large family and children. I wanted to maintain a laundry near the kitchen, view the pool, open up to the family room for TV watching and entertaining, have a computer workstation, and update the fireplace. You helped us with selection of materials, space planning and guidance with contractors. After 11 years in our home we are thrilled to finally have the functional family living spaces we desired and the kitchen of our dreams. We truly understand that hiring a designer saved us time and therefore money, decreased our stress and gave us confidence in our decisions, while preventing us from making mistakes. And thank you for the depth of which you cared about our project. I completely trust Patty’s abilities to assess our home and design according to our busy lives and growing 3 children. Patty is very professional and gets the job done. It was so much fun to be locked out of my room until she unveiled her work! I felt like I was on a TV show. Patty truly cares about her clients as friends. She is also easy to talk to and is a great listener. I listed a house that Patty had redone for the seller. The choices of colors and materials were tasteful, harmonies and in keeping with the price point of the property. Most recently, I have requested Patty’s help in staging several of my listings. She has a terrific eye for color and the ability to see the possibilities of repositioning furniture and accessories. Most importantly, she can tell the sometimes reluctant homeowner what needs to be done with a perfect combination of firmness and good humor. I can enthusiastically recommend Patty to anyone needing excellent interior design. I just wanted to let you know the paint is on the walls and it looks gorgeous. Thanks you again for all your help…..I love it!